Savannakhet is not one of those towns that immediately jump up and grab you: it is quiet, mostly nondescript, a place still waiting for the economic boom to happen. It isn't without interest, though for most visitors, it is just a place where they get on or off the buses to other places, including Vietnam (see One The Road: Hue to Savannakhet). The town sits beside the Mekong, with long views of the riverscape and the freight and passenger traffic, much of it laden down to the point where it looks like the slightest ripple will wash over the decks. On board are cargoes from the industrial centres of China, Vietnam and Thailand: some, like the huge lorries lining flat decks, striking in their calm progress through the deep water. Savan is a crossroad: from west to east the ferry from Mukdahan links via Laos's Route 9 to Lao Bao on the Vietnamese border and from there roads connect to places like the port of Da Hong and the old royal city of Hue; from north to south, Route 13 (currently being upgraded) stretches from Luang Prabang, via Vang Vieng and Vientiane to Savan and on to Pakse and Si Phan Don. 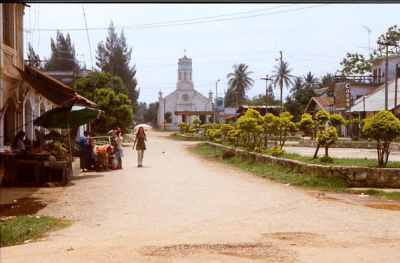 Perhaps the most beautiful part of Savan is Wat Sainyaphum, with its tranquil grounds just across the ferry terminal road from the Mekong. It dates from the end of the 19th century and much of it has been restored to house a large resident population of monks and novices and provide secondary education for day pupils as well as its own. We arrived there on a day of blistering heat and sudden monsoon squalls and sat in the shade of the trees for a couple of hours while the rest of the town did not flow past. 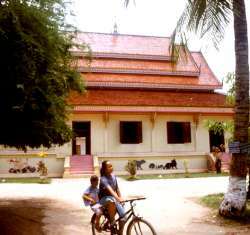 Just a woman on a bike (picture right), a child on the back, and a tuk-tuk using the wat's grounds as a shortcut to avoid roadworks. Boun, a novice monks, was eager to try out his English (see On The Road; Savannakhet) and we had one of those strange conversations of fractured English, tortured Lao, many gestures and even more good-natured misunderstandings. We sat opposite the main temple, its decoration of creatures real and mythological looking friendly and welcoming. Inside, in the cool, the fine wall paintings and a Buddha image drew the eye and the intellect. The Christian churches (top right) are worth seeing, too, with their French colonial settings, fading in colour and texture while the beliefs are still bright enough for the congregants to be hauled off to jail by enthusiastic state security officers. According to UK Christian activists in mid-2001, Christians from a number of towns, including Savan, were accused of anti-state activities and their faith was seen as indicating clandestine liaisons  despite the state constitution guaranteeing the freedom of religious worship. There is also a big market, frequented by ethnic minority people from the countryside as well as those from the town, by the bus station and a few stalls do some business by the ferry terminal. Restaurants and places to stay are not the strong points of the town, though there are plenty of cheap places and one at the other end of the scale, the Chinese-built Nanhai offers large suites for $44 a night [May 2001]. The restaurant is good too, once you get past the language problems. Vegetarians do not do well in Savan but can survive, especially if they fancy a treat at the Nanhai. A couple of days should be enough. Any longer  for instance, waiting for a visa for Vietnam  could have you going gently round the bend. You can get good bus links south, north to Vientiane or east to Vietnam. The quality of the ride varies from the luxury of some Vientiane services, to the enjoyable/bearable going south, to the nightmare of the run to the Vietnam border. It is also a short hop to the Thai border at Mukdahan. Local travel companies can offer trips and transport.